The two-month field training, called Foal Eagle, has been in full swing to test the combat readiness of the allies, amid high tension on the Korean Peninsula in light of a torrent of bellicose rhetoric by North Korea. It kicked off on March 1 and runs through April 30. U.S. nuclear attack submarine USS Cheyenne (SSN 773) is anchored at the southeastern port city of Busan on March 20, 2013. The U.S. nuclear attack submarine USS Cheyenne (SSN 773) has been carrying out anti-submarine drills since March 13 along the east and south coasts of the peninsula, according to military officials. 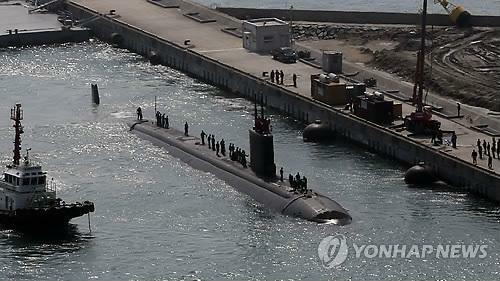 Although the U.S. navy has sent its nuclear submarines in past drills, military equipment capable of delivering nuclear weapons mobilized in this year’s drill, such as the B-52, have drawn keen attention after Pyongyang threatened a pre-emptive nuclear strike against Seoul and Washington in the wake of U.N. sanctions over its recent nuclear test. The South Korean Navy deployed an Aegis destroyer, corvettes and submarines as well as anti-submarine and maritime surveillance aircraft to take part in the maneuvers aimed at detecting submerged threats, officials noted. USS San Francisco (SSN-711), a 6,800-ton Los Angeles-class submarine, in early February participated in a highly publicized joint drill with the South Korean Navy, seen as attempts to send a strong message to the North, which was preparing for its third nuclear test. In response to the North’s threats of nuclear attack, the Pentagon last week announced the plan to step up its missile defense system against the North and reaffirmed its commitment to provide extended nuclear deterrence on the Korean Peninsula. During his visit to Seoul on Monday, U.S. Deputy Secretary of Defense Ashton Carter promised every possible resource to provide a nuclear umbrella for its ally, revealing that the nuclear-capable B-52 would join the flight training mission on Tuesday. After the B-52 returned to its Guam base, Pyongyang on Wednesday vowed military action if the U.S. deploys the B-52 again on the peninsula. North Korea has a large fleet of submarines, and one of them torpedoed a South Korean Navy warship, the Cheonan, in the Yellow Sea on March 26, 2010, according to the conclusion of an international investigation. A total of 46 sailors were killed. This entry was posted in The world's submarines, US Submarines and tagged Aegis, Destroyer, South Korea, SSN 711, SSN 773, USS Cheyenne, USS San Francisco on March 20, 2013 by jasonlockley.